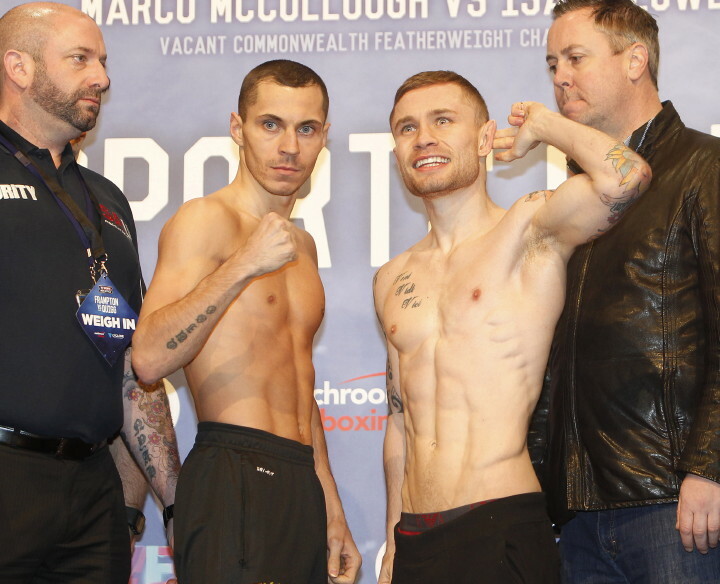 (Photo credit: Matchroom Boxing) Not long to go now until Carl Frampton Vs. Scott Quigg, one of the biggest fights to take place in the UK in some years, finally gets underway. Frampton, the reigning and defending IBF super-bantamweight king, remains an ever so slight betting favorite to win the fight and take Quigg’s WBA 122-pound belt, but no fan – despite what they may say now or what they might say after the fight – is at all sure what will happen when the bell rings in Manchester. This, of course, is the sign of a great match-up; with two of the best in the division squaring off with one another. The pre-fight hype and build-up has been quite something, with the two camps being notably prickly with each other – to the point where there has been pushing and shoving (between not only the two fighters, but also rival trainers, Joe Gallagher and Shane McGuigan) and threats of pulling out of the fight due to a dressing room spat. All of that will go away once the bell rings, but the British Boxing Board of Control reminded both parties, The Manchester Evening News reports, to keep orderly conduct during the high profile encounter. Quigg’s team insist Barry McGuigan, the manager of Frampton, not be allowed in the ring during the final instructions of the referee. Frampton’s team demands Joe Gallagher, trainer of Quigg, is not allowed to touch the low blow protector of the Belfast man before the fight. Frampton’s team have also insisted how Quigg’s numerous gym-mates are not allowed in his corner during the fight. Mind games and nothing more, or key issue that could prove, well, key? Both fighters sound ultra-confident, despite all the words and the posturing that has gone on and is still going on. “The key to this fight is composure and believe me, I will get in that ring composed, relaxed, sharp-minded, switched-on and do what I’ve done in the gym,” Quigg vowed, as quoted by The Manchester Evening News. I go for the bigger, more powerful Quigg – aided massively by the game-plan provided by the master brain of Gallagher – to get a stunning stoppage win inside five-rounds.